Measuring the Ivy 2018: A good year for returns, but is efficiency becoming an issue? Similar to 2017 performance, this past fiscal year was a strong one for most Ivy League endowments. Fiscal year 2018 is noteworthy, however, for being the first year that long horizon (10-year) returns from all Ivy endowments lagged behind the 60-40 portfolio. The Ivies continued the strong results of FY 2017, with all but Columbia registering double-digit returns in FY 2018 and all beating a 60-40 portfolio. The rankings across Ivies for FY 2018 are very similar to those of FY 2017, with Columbia being the notable exception. Columbia’s 9% return was rather unexpected given its apparent asset class exposure. Part of this may have to do with its 2016 change in management. Harvard still ranks among the low performers in the Ivy League. Exposure to illiquid investments remains high, and for some Ivies it appears to increase. Private equity markets rallied strongly over the last fiscal year, beating public equity markets in a reversal of FY 2017 performance. In fact, private equity and venture capital exposure were among the biggest contributors to returns across most Ivies, as we recently projected. 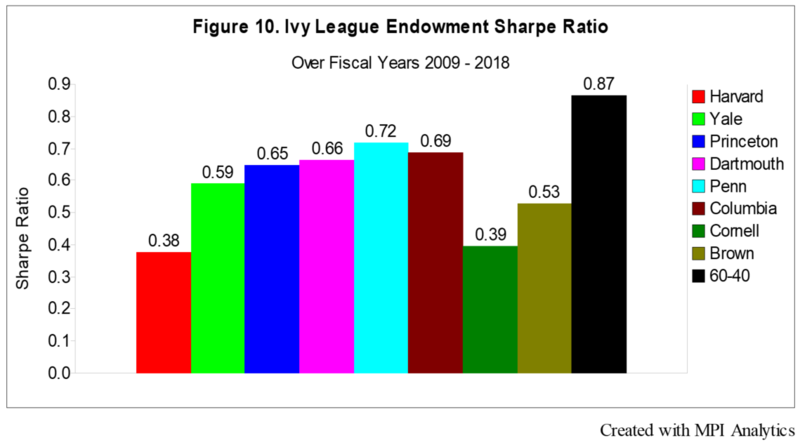 It is the first time in the 20 years of available Ivy endowment returns data that a 60-40 portfolio outpaces all Ivies in terms of 10-year performance. For 15- and 20-year performance, the Ivies still appear to have an edge on the 60-40 portfolio. Estimated Ivy endowment risks, however, remain significantly higher than a 60-40 portfolio, primarily driven by real estate and private equity. And none of the Ivies appears to be as efficient as a 60-40 portfolio over the last 10 years, as measured by Sharpe ratio. 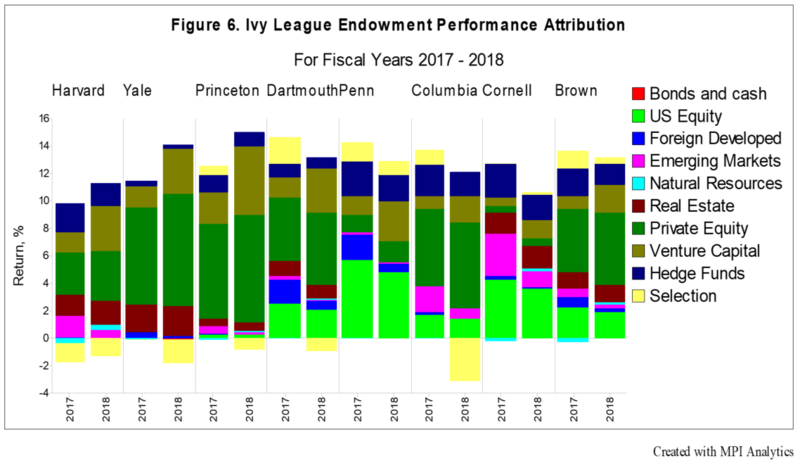 Similar to 2017 performance, this past fiscal year was a strong one for most Ivy League endowments. All of the Ivies beat a 60-40 portfolio, a commonly cited1 benchmark. For the majority of these endowment systems, exposure to private equity and venture capital appeared to be the dominant driver of returns, based on our proprietary returns-based analysis. 2018 is noteworthy, however, as it is the first year that long horizon (10-year) returns from all Ivy endowments2 lagged behind the 60-40 benchmark. The Ivies also appear to have significantly higher levels of volatility over the 10-year period than those of a 60-40 portfolio. Both of these issues cast doubt on the efficiency of the Ivy endowment model over the long-term. As of July 2018, the total AUM among the Ivy League endowments was $135.7 billion,3 representing an increase of $11.5 billion from fiscal year 2017. 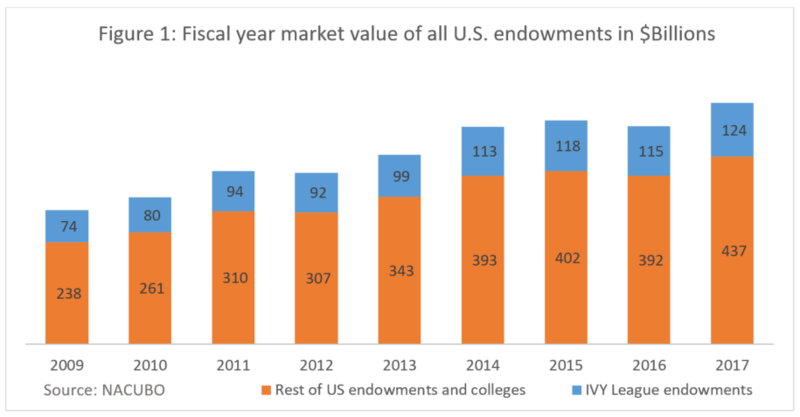 In Figure 1 below, we break down how Ivy assets compare to the rest of endowments and colleges between 2009 and 2017.4 Assets among all endowments were up by 68% between 2009 and 2017, with Ivies managing approximately one quarter of total endowment AUM each year on average. Endowment performance should be evaluated in three ways. First, we need to examine if the endowments preserve value and purchasing power after spending. The historical or target payouts of Ivies are around 5%. With inflation being at 2.8% over the past 10 years,5 this means Ivies had to outpace a combined return of around 7.8% to cover expenses. Second, we can compare the Ivy performance against broad measures of equity and debt markets. This is standard practice among many endowments when they communicate performance numbers. Such a portfolio also serves the purposes of highlighting whether investments made by the Ivies in the private markets achieve better returns than the public ones. We’ve used a blend of 60% equities and 40% fixed income as a suitable benchmark for this reason. Third, we want to find out whether endowments keep pace with peers that pursue similar mandates. Similar to fiscal year 2017, this past year was another strong year for all Ivies. All of them beat a 60-40 portfolio during 2018, and they all delivered returns well above their historical payouts, even after considering inflation. Princeton beat the rest of its Ivy peers, delivering a 14.2% return and continuing its fairly consistent trend of ranking among top Ivy performers. Harvard continues its 7-year trend of ranking at or near the bottom of the class with 10% returns in fiscal year 2017. Perhaps more strikingly, Columbia falls from the third place in 2017 to the last place in 2018, delivering a 9% return. Since the investment horizon that endowments focus on is long-term, it makes sense to examine performance over a longer time period. And when looking at the 10-year performance of the Ivies, we see that fiscal year 2018 was the first time in two decades that a 60-40 portfolio beat all Ivies in 10-year performance. And apart from Princeton and Columbia, all other Ivies fall short of their combined payout rate of 7.8% over the same 10-year period. 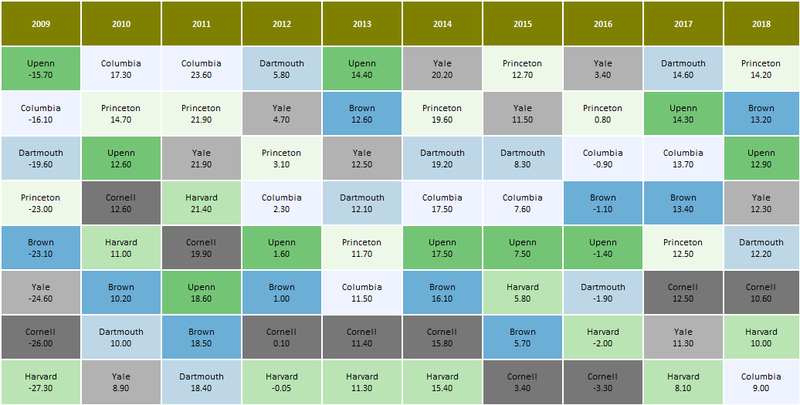 Interestingly for the past 10 years, Columbia and Princeton have been top performers. 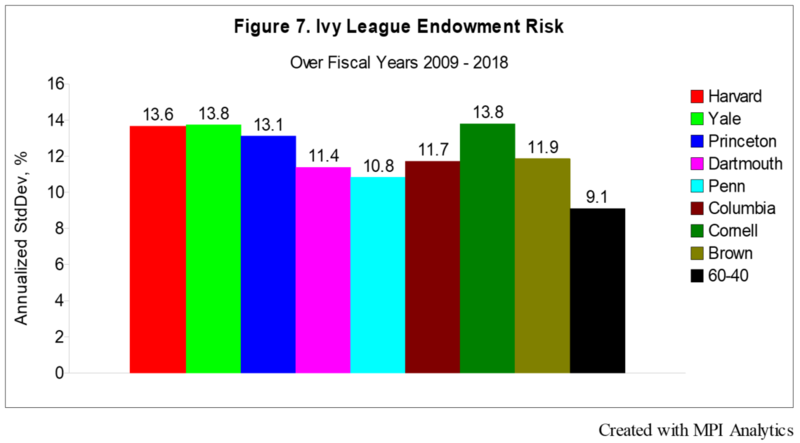 Harvard, the largest Ivy endowment, exhibits a 10-year performance that is a mere 4.5%, which is significantly less than its target annual endowment payout rate of 5.0% to 5.5%. 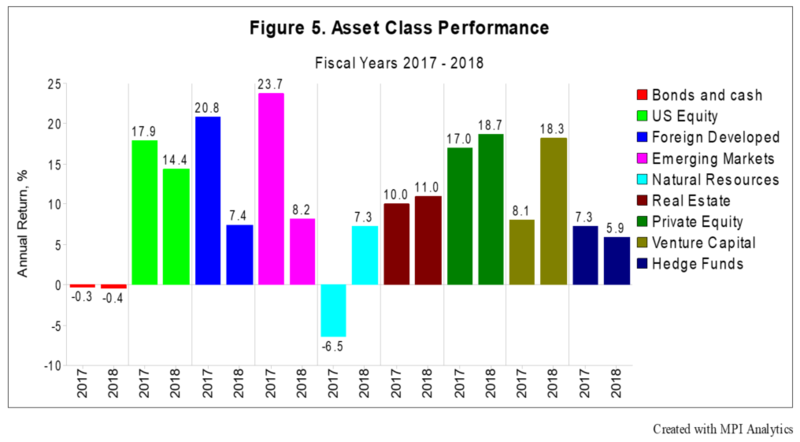 We need to note, however, that this time range includes fiscal year 2009, a very unusual down period for the asset classes that Ivies invest in. Next year, we expect most Ivies to have good chances of surpassing the 60-40 benchmark over a 10-year time range, given that 2009, their worst year in recent history, will be outside the 10-year window. To capture endowment exposures and ensure an apples-to-apples comparison, we analyze each Ivy endowment’s return time series using a common factor set across all endowments (see Table 1). This enables us to create a factor-mimicking portfolio for each endowment that can provide further performance insight. The analysis was conducted using our proprietary Dynamic Style Analysis (DSA) model. DSA is an enhanced quantitative (returns-based) analysis model that provides a more transparent view of opaque or complex investment strategies, funds and products. Through this model, we then compare the returns of the endowments since 2005 to their factor mimicking portfolios. 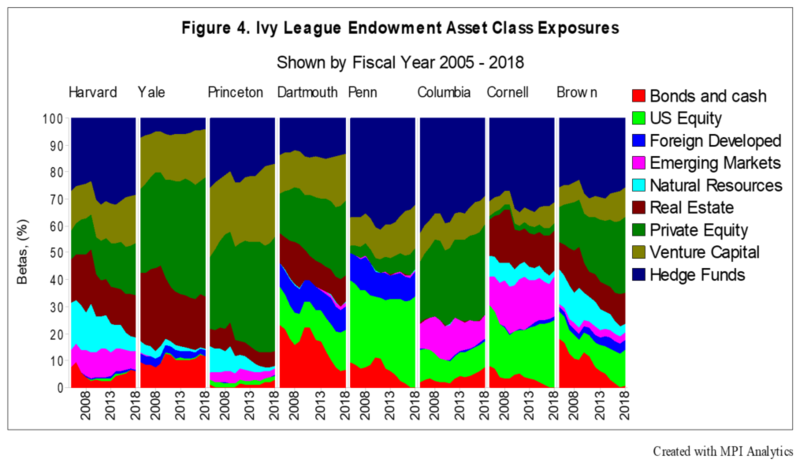 The chart (Figure 4) displays the dynamic asset class exposures6 obtained for each Ivy League endowment over the past 10 years. We observe that estimated exposure to private asset classes, notably private equity, venture capital, real estate and hedge funds, remains high and, for many Ivies, is increasing.8 For example, Brown appears to be moving faster into private equity than others, while Princeton and Yale behave as if they maintain the highest exposure to private equity and venture capital than the rest of the class. These findings align with the recently reported fiscal year 2018 allocations for Brown, fiscal year 2018 allocations for Yale, and Princeton’s fiscal year 2018 policy allocations. The largest estimated contributor to aggregate Ivy endowment performance in fiscal year 2018 was exposure to private equity and venture capital. This was also the case in fiscal year 2017, but the contribution is more pronounced in 2018. These asset classes achieved the highest returns in fiscal year 2018 relative to all the other asset classes that Ivies typically invest in, surpassing public equities by a large margin, particularly foreign developed and emerging market equities, which underperformed domestic stocks. As is evident from the performance attribution chart, for some of the endowments there is a notable portion of the returns labeled “Selection” that is not explained by the systematic factors. Such “unexplained” returns may be due to individual manager security selection skill (or lack thereof), asset classes not represented in our factor map of common exposures (e.g., emerging market bonds), intra-year tactical asset allocation shifts not captured by our model—which is based on annual data points, and also potential differences in valuations (for private and illiquid investments). We observe that both Penn and Brown stand out among their peers in having (consistently) positive selection returns augmenting their overall results, while the rest of the Ivies achieve negligible or negative unexplained returns in fiscal year 2018. Columbia, in particular, stands out with a large and negative 3% unexplained return portion, in contrast with fiscal year 2017. Part of this may have to do with a recent management change that took place in 2016. From their financial reports, it is evident that Columbia has been decreasing allocation to private equity over the past two years, going from 21.7% in fiscal year 2016 to 20.5% in 2017 and 18% in 2018. It could be that during such an allocation shift there have been mark downs in private equity or other asset classes similar to Harvard’s recent mark downs in natural resources. Or it could simply be that Columbia’s fund managers have underperformed in relation to the benchmarks used in our analysis. In other words, by pure estimated asset class exposure, Columbia’s return was expected to be close to 12% vs. the realized 8%. 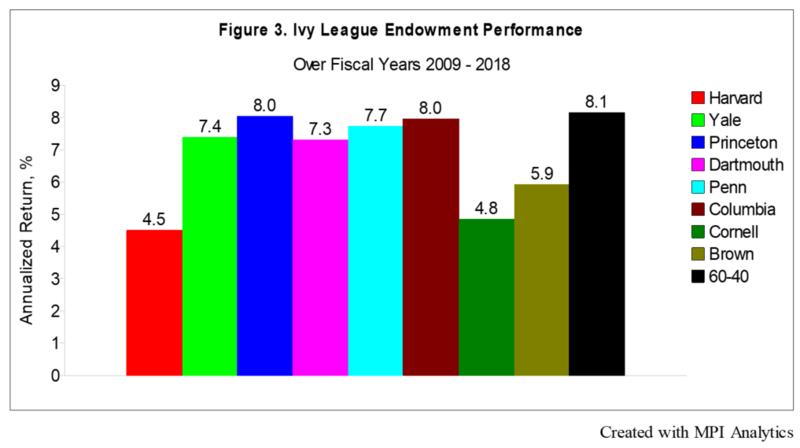 The exceptional results of most Ivies over the past two years may have proponents of the Ivy endowment model claim that it has worked well with respect to meeting their target payouts. They may also defend Ivies falling short of a 60-40 portfolio in 10-year performance by suggesting the relatively smooth upward trajectory of stock and bond prices was supported by extraordinary global monetary policy measures—which is easy to see in hindsight—and by saying that Ivy portfolios are well-positioned to weather market downturns with limited downside due to diversification across asset classes. That’s not how investments are typically viewed in the ex-endowment world, however, and a more objective way to evaluate whether this is true and how efficient these portfolios are is to attempt to measure how much risk endowments have taken during the past several years. Although it is generally known that the assets endowments invest in are risky, quantifying such risks with any precision has remained challenging for industry practitioners. The illiquid nature of venture capital, leveraged buyouts and real estate―combined with the large allocations to those asset classes―make it hard to estimate the true risk tied to the observed, smoothed returns of private market segments. 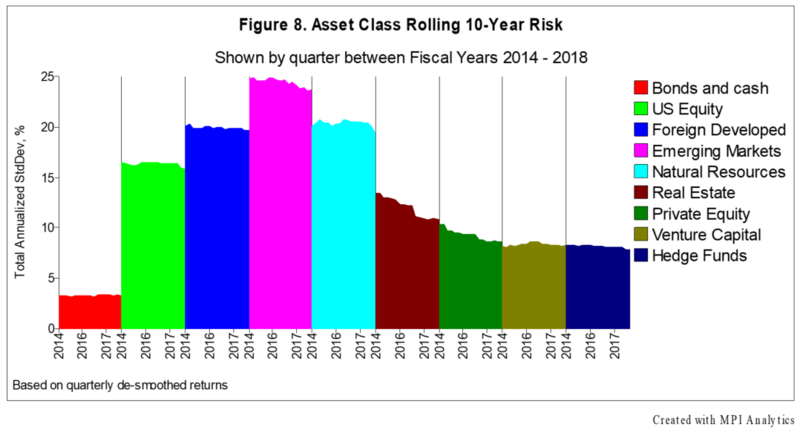 Additionally, the fact that portfolio returns are only available annually to the public means that they are too infrequent for reasonable risk estimates. Following an approach that was recently published in CAIA’s Alternative Investment Analyst Review, we calculated the risk Ivy endowments may take using a three-step process. Mimicking endowment portfolios: Using published annual performance data, we constructed factor mimicking portfolios for each Ivy endowment via our patented Dynamic Style Analysis model, which enabled us to use a set of indices that correspond to the asset classes commonly disclosed in annual endowment reports. Because these factor portfolios closely replicate observed endowment performance, we use them as proxy series to estimate endowment risk. Accounting for illiquid investments: Given the illiquidity issue mentioned above, some of the selected factors―such as private equity, venture capital and real estate―are artificially smooth, which would cause us to underestimate risk. To address this issue, we apply a de-smoothing technique, which improves risk estimation. Risk Measurement: We then replace the de-smoothed private equity, venture capital and real estate factors in the factor mimicking portfolios. This provides a sufficient number of data points to produce meaningful risk and drawdown estimates. Using our process, we observe that the high endowment returns are accompanied by high risk. Yale and Princeton, traditionally high performers, are estimated to be taking the largest risks due to their high exposure to alternatives. Ivy risks are noticeably higher than a 60-40 portfolio, with private equity and real estate contributing the most across the board. In fact, equity (public and private) and real estate risk are the two dominant sources of risk across the Ivies, indicating their portfolios are not as diversified as many believe them to be. As seen in the chart below (figure 8), exposure to private asset classes doesn’t come without risk. 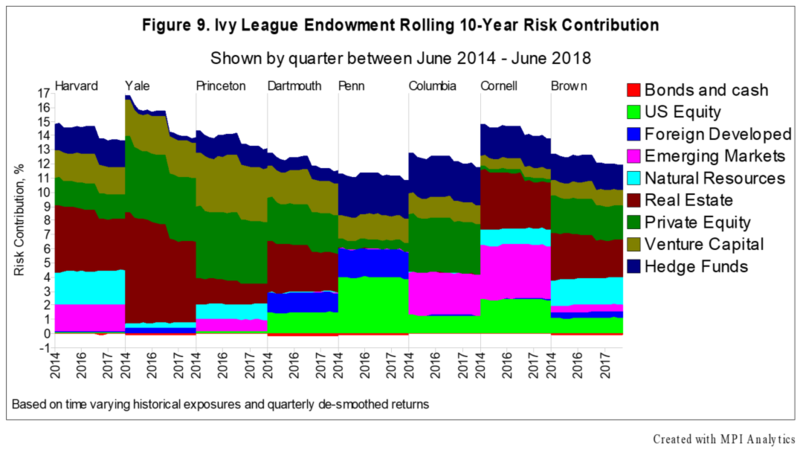 In fact, such exposure contributes the vast majority of risk across most Ivies. Over the last five years, we notice that such risks have somewhat receded mainly due to a reduction in the risk of real estate, the only asset class to record positive returns in all but one quarter9 since the financial crisis. At the same time, real estate risks are estimated to be quite high and about the same as the risks involved when investing in emerging markets. While emerging markets have been known to have elevated risks, exacerbated recently due to the looming trade war with China and the Federal Reserve’s ongoing tightening policy, we don’t hear much about the inherent volatility in private real estate. This is because the investor experience is based on smoothed returns that mask higher volatility. Based on the previous risk estimations and our factor mimicking portfolios, we then calculate Sharpe ratios across the Ivies.10 The Sharpe ratios are shown in Figure 10 and are, remarkably, significantly lower than the Sharpe ratio of a passive 60-40 portfolio. This should somewhat be expected, given previous risk estimations for the Ivies. For investors, analysts, and consultants, this raises the question of how efficient the endowment model actually is, and whether endowment returns justify the risks taken. 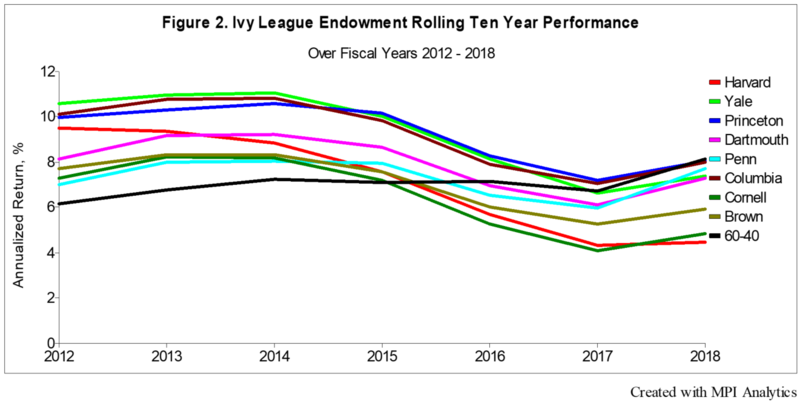 Fiscal year 2018 was a stronger year for Ivy endowment performance than fiscal year 2017. Traditional outperformers continued to outperform, taking advantage of a strong year in private equity and venture capital. Looking back at the past 10 years, however, none of the Ivies were able to beat a domestic 60-40 portfolio, a traditional measure of a diversified portfolio. With the prospects of increasing inflation and spending rates that have generally been on the rise over the past few years, endowments are admittedly under pressure to achieve superior performance. In the process of doing so, they employ a variety of tactics, such as investing in illiquid asset classes with the hope to earn long-term premia or carefully selecting hedge funds that promise to provide alpha and diversification. What is not being advertised here is how much risk Ivy endowments may take in the process. This apparently is significant, resulting in portfolios that are not all that efficient. In today’s increasingly more fragile markets, with the Fed’s normalization policy pressuring markets, the return of volatility in October and ongoing concerns over a global trade war, it is important that investors who are mimicking the Ivy endowment model—especially those who do not have the high risk tolerance levels and/or time horizons of elite endowments—understand and carefully manage the risks of significant allocations to alternative asset classes. The average investor does not have the luxury of long horizons that allow endowments to weather significant market downturns and volatility. They may also lack the expertise and resources required to invest (successfully or not) in alternative asset classes―e.g., due diligence abilities, risk and portfolio management, etc.―that the Ivy league endowment investment offices have built over time. 1The domestic 60% equity (S&P 500 Index), 40% bond (Bloomberg Barclays U.S. Aggregate Bond Index) portfolio originates as a traditional benchmark from the pension world to measure a diversified or balanced portfolio against. Since endowments, and particularly large, well-funded ones, have significantly different compositions than a liquid, domestic 60-40 portfolio, including a small allocation to traditional fixed income, global exposure and less liquid, more esoteric private markets assets, as well as different time horizons and funding needs, using a 60-40 as a benchmark for elite endowments is imperfect. Yet, it provides some measure of what a simple, liquid, low cost and diversified model could attain relative to the complexities, illiquidity and higher cost of the Ivy or Yale endowment model. For brevity, we are not suggesting an alternative, more appropriate benchmark in this piece of research. The 60-40 portfolio is rebalanced daily, and returns are gross of trading costs or other fees. 2Endowment returns are quoted net of fund management fees. Returns do not, however, include endowment overhead fees, including operational, research, asset allocation, manager selection and monitoring, and risk and liquidity management. The Ivy endowment returns used in this study were self-reported by each endowment. 3This number was calculated by compiling July 2018 AUM figures published by the Ivy endowments. 4Based on AUM figures published by The National Association of College and University Business Officers. 5Based on a year over year return of the CPI all items index as of June month end. 6DISCLAIMER: MPI conducts performance-based analyses and, beyond any public information, does not claim to know or insinuate what the actual strategy, positions or holdings of the funds or companies discussed are, nor are we commenting on the quality or merits of the strategies. This analysis is purely returns-based and does not reflect actual holdings. Deviations between our analysis and the actual holdings and/or management decisions made by funds are expected and inherent in any quantitative analysis. MPI makes no warranties or guarantees as to the accuracy of this statistical analysis, nor does it take any responsibility for investment decisions made by any parties based on this analysis. 7We used preliminary data for the quarter ending on June 30, 2018, representing 61% of active funds updated compared to the prior quarter’s NAV for US Buyout and 68% for US Venture Capital. 8Part of the bond and cash exposure may reflect uncommitted capital that corresponds to private equity, venture capital or real estate. Natural resources may also reflect private investments. 9The first quarter of 2012 was the only one that the Cambridge Real Estate Index reported a (slightly) negative return of -0.2% across the entire period between January 2010 to June 2018. 10To make sure that we don’t overestimate or underestimate the calculated Sharpe ratios based on the factor-mimicking portfolios, we take an extra step to ensure that the total return from each factor-mimicking portfolio at each fiscal year equals the reported annual endowment return. To do this, we add a constant to each quarterly return of a factor-mimicking portfolio within a given fiscal year, such that the geometrically compounded factor-mimicking portfolio return equals the reported annual Ivy return. For the 14 fiscal years we examine, this means that we end up with 14 constant terms per each factor mimicking portfolio. I was struck by the across the board underperformance. I’d like to see the 10yr perf vs a more realistic bmk. 60/40 with monthly/annual rebal and net of estimated costs. In this post, we use daily rebalancing of the 60/40 benchmark: 60% S&P 500 / 40% Bloomberg Barclays US Aggregate Bond Index. And while daily rebalancing provides an objective measure, some would argue that quarterly or annual is more practical. Below we show the 60/40 results for different rebalancing frequencies, which reinforce our findings that the majority, if not all Ivys, underperform a simple passive benchmark. As far as the trading costs go, the expenses of running an endowment, including external manager due diligence, would dwarf any rebalancing costs.